Imagine an artificial leaf that mimics photosynthesis, which lets plants harness energy from the sun. But this leaf would have the ability to power your homes and cars with clean energy using only sunlight and water. This is not some far-off idea of the future. It's reality, and the subject of a jury-prize-winning film in the GE Focus Forward Film Competition. 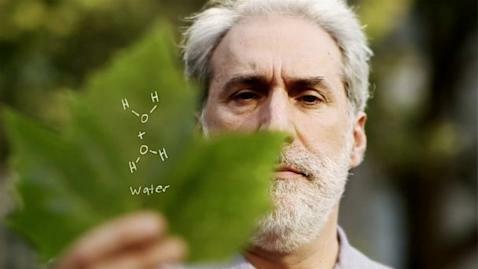 Jared P. Scott and Kelly Nyks' short film, " The Artificial Leaf," showcases chemist Daniel Nocera, the inventor of the artificial leaf, a device that he says can power the world. "The truth is stranger than fiction," Kelly Nyks, a partner at PF Pictures, told ABC News. "What I think is so exciting is that Dan has taken this science and applied it in a way that makes bringing it to scale to solve the energy crisis for the planet real and possible." Nocera's leaf is simply a silicon wafer coated with catalysts that use sunlight to split water to into hydrogen and oxygen components. "Essentially, it mimics photosynthesis," Nocera told ABC News. The gases that bubble up from the water can be turned into a fuel to produce electricity in the form of fuel cells. The device may sound like science fiction fantasy, but Nocera said he hopes one day it will provide an alternative to the centralized energy system - the grid. Worldwide, more than 1.6 billion people live without access to electricity and 2.6 billion people live without access to clean sources of fuel for cooking. "This is the model: We're going to have a very distributed energy system," Nocera told ABC News. With the leaf, "using just sunlight and water, you can be off the grid. If you're poor, you don't have a grid, so this gives them a way to have energy in the day and at night." With just the artificial leaf, 1.5 bottles of drinking water and sunlight, you could have enough electricity to power a small home, but the cost is still a problem, though Nocera said he believes that will come down with time and research. The artificial leaf is cheaper than solar panels but still expensive. Hydrogen from a solar panel and electrolysis unit can currently be made for about $7 per kilogram; the artificial leaf would come in at $6.50. Nocera is looking for ways to drive down the costs make these devices more widely available. He recently replaced the platinum catalyst that produces hydrogen gas with a less-expensive nickel-molybdenum-zinc compound. He's also looking for ways to reduce the amount of silicon needed. In 2009, Nocera's artificial leaf was selected as a recipient of funding by the U.S. Department of Energy's Advanced Research Projects Agency (ARPA-E), which supports energy technologies that could create a more secure and affordable American future. Nyks and Scott said they hope "The Artificial Leaf" will bring awareness to the public that sustainable energy solutions do exist. "We make films for social action," Scott, also a partner at PF Pictures, told ABC News. "We see films as a tool for social change. And what I think Dan sketches out is that we start with energy. And if we solve the energy crisis, we'll solve the climate crisis, and then we'll solve the water crisis, and then we'll solve the food crisis. But it starts with energy." 30 filmmaking teams were asked to make a movie that could highlight an innovation that could change the world as part of GE Focus Forward, a series of three-minute films created by award-winning documentary makers including Alex Gibney, Lucy Walker, Albert Maysles and Morgan Spurlock. Nyks and Scott won a jury prize in a related global competition. Anyone with an Internet connection has access to the videos online. All the films are featured at focusforwardfilms.com. So far, total media impressions for GE Focus Forward have exceeded 1.5 billion. In addition, the films are screening at all the major film festivals around the world and have played on every continent, including Antarctica. Nyks and Scott said they hope to take the success of the short and turn it into a feature-length documentary.